Now that you’ve all had your fill of Predators in our last giveaway, we’ve got something even more frightening lined up! 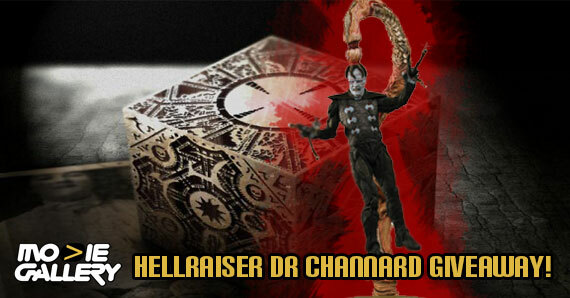 NECA has provided us with a very rare Hellraiser figure that we are sure you will be excited about. This is your chance to win a massive Dr. Channard figure — it’s one of the biggest figures we have ever given away. This deluxe figure comes with lots of extras and is valued at over $200! Includes alternate head, ball jointed tentacle, and nine different snake accessories, all with different horrifying attachments. An obsession with Hell and the Cenobites are just one glimpse into the twisted mind of Dr. Channard. With the help of Tiffany and Julia, he was able to access the gates of Hell, and Leviathan gave him the ability to transform into a Cenobite. This deluxe box set contains not only the Dr. Channard figure, but also a wide array of accessories. The figure itself stands at a monstrous 11″, not including the disgustingly detailed tentacle which connects it to the intricately detailed base. It is easy to enter this giveaway. If you really want to increase your chance to win this extremely rare figure, you can gain an edge with your Facebook or Twitter account. We really enjoy doing all of these giveaways here at Moviegallery.com. If there is something special you would like to see us give away in our next contest, please let us know! 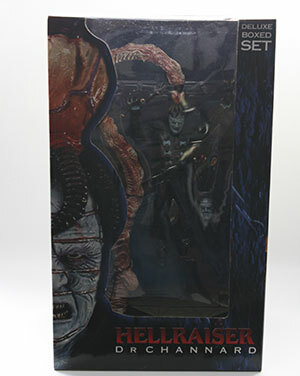 This entry was posted in Contests & Giveaways, The MG Blog and tagged dr channard action figure, dr channard giveaway, hellraiser, hellraiser action figures, hellraiser giveaway, neca by summerm. Bookmark the permalink.